The organisers of Mr Gay World™ South Africa have announced that the contest to select a delegate to represent South Africa at Mr Gay World 2019 in Cape Town will be held online. The decision was made in light of South Africa unexpectedly taking on hosting duties for Mr Gay World 2019. The organisers for this year’s original Mr Gay World host city, Hong Kong, were forced to drop out after facing opposition from the authorities in China. After accepting the mammoth task of moving the prestigious international event to Cape Town, arguably the world’s most stunning gay capital, the local organisers decided to postpone Mr Gay World South Africa 2018 and to redirect their resources towards the international contest. “Due to these challenges, we did not hold a physical competition last year, but will now instead run an online contest,” explains Johann van Niekerk, Director: Mr Gay World South Africa. “The winner will not only earn the 2018 title but will also have the honour of competing in Mr Gay World, which takes place from 28 April to 4 May 2019,” he says. Entries for the South African title are now open at www.mrgwsa.com and will close on 29 January 2019. A panel of judges will shortlist 10 entrants, who will be joined by two “wild card” contestants who won regional titles last year: Johannesburg Pride’s Mr Pride of Africa 2018, Wade Schaerer, and the Pink Loerie Festival’s Mr Mardi Gras 2018, Kevin Du Plessis. On 2 February 2019, online voting will be opened for the public to choose their favourite to take the Mr Gay World South Africa crown. These votes will be added to points earned by the 12 finalists in their online campaigns promoting a charity or cause to then select the ultimate winner. The online competition will close on 28 February 2019. 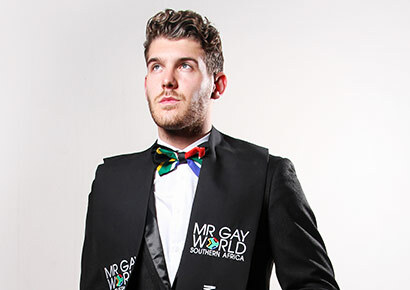 Proudly gay South African men who wish to stand up as role models for their community and represent South Africa at Mr Gay World 2019 are urged to go to www.mrgwsa.com now to enter the contest. The Mr Gay World Annual VIP Dinner will take place on Friday 3 May 2019 at The President Hotel and the Mr Gay World 2019 Cape Town, South Africa Grand Finale will take place the following evening, Saturday 4 May, at the Cape Town City Hall. Tickets for the VIP Dinner will be available beginning February, while tickets for the Grand Finale are already available here.